What is inspiration exactly? It’s something that can fire you up to get started on a new design or technique. It is often related to creativity and without it, you might find yourself tiring of creating the same thing over again. So where does inspiration come from? It isn’t something you can nip out and pick up from the corner shop… or is it? Well, not exactly but there are plenty of places where inspiration for leatherworkers is in abundance. Museums: An afternoon spent at your local museum can be very inspirational. It’s not necessary to do anything other than look around, read the information and soak up the history. Your interest while you’re there needn’t be restricted to leather items specifically; look at fasteners, buttons, buckles, or study seams or stitches. Inspiration may not be triggered immediately but give it a day or so…. Pinterest and Instagram: Great places to learn and be inspired. I once saw a post where someone had used a different colour linen thread at the back of their work, than they had at the front. It aroused my curiosity and inspired me to work out how they’d done it using a single thread. This led to hours of experimenting with dyes and threads in the workshop, not to mention the time spent perfecting thread tension so that I got a good result myself. Library: Leatherwork books are an obvious choice when looking for inspiration, but look also at books relating to other crafts and skills – these are often just what you need to inspire a return to the workshop. The passion of the author(s) combined with the different tools and methods can trigger an interesting combination of possibilities. For example, could you apply an embroidery stitch, or use a woodworkers’ tool on a leatherwork project? I once emailed a student asking how he had skived the leather for his project; to my surprise he send me a photo of no less than 13 different knives and tools… most of them not intended for leather working. YouTube: There are plenty of YouTube videos available offering help and advice relating to leatherwork (video makers; we applaud you!) These videos will inevitably introduce you to new tools, tips and techniques – hopefully encouraging that flash of inspiration! Antique shops: Similar to museums, although with the opportunity to have a more *tactile experience, antique shops rarely fail to inspire. Usually stocked with a vast range of textiles, furniture, objects, art and literature. Often too, you’ll find both hand and machine stitched leather items dating from WWII. People: The accomplishments of other people can be truly inspirational. I personally have always been inspired by the moulded and laminated work of Garry Greenwood – in particular, his amazing leather musical instruments. People can also be used as inspiration in other ways. For example, I worked with a student who’s inspiration for her leather project was based on her perceptions of politicians’ failings. Others have used individuals, historical figures or celebrities as inspiration for new designs. Nature: For shape, pattern and colour, nature offers a great source of inspiration. In my view, the colours in nature don’t clash – by that, I mean to suggest that any sudden colour changes in the hedgerows, no matter how bright, are never ‘garish’. Shapes and pattern are in abundance here which offers endless sources of inspiration for leather moulding, carving or other forms of leather art. The inspiration for leatherworkers is always there; the challenge is merely to find its source! 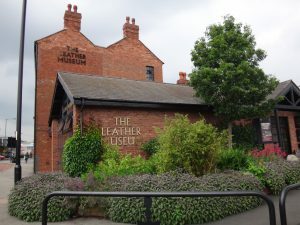 *See pages 31 & 32 of issue 1 of ‘Waxing the Thread’ leatherwork magazine, if you’re seeking a tactile experience at the museum.